Place all the above ingredients into a stockpot or dutch oven. Bring the mixture to a boil, and then turn down to simmer for at least 20-30 minutes. When finished simmering remove bay leaves. If desired, you can strain out the other dried leaves. Bring tomato soup back to a simmer, and then let cool. When white sauce has thickened, allow it to cool. Add the white sauce to the tomato mixture, stirring constantly. If using real milk, the white sauce should be cooler than the soup, and you must stir constantly so the milk doesn't curdle. If it does begin to curdle, use a whip to blend it well. 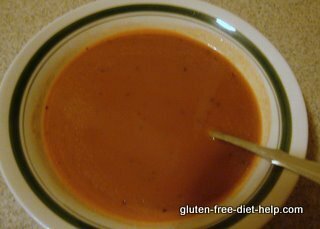 When all ingredients are well blended, bring the gluten free soup back to a simmer until it reaches the desired thickness of consistency. Adjust salt and sugar to taste. Serve. If you like Campbell's version, you will enjoy this version. It takes about 45 minutes to an hour to get it to the table. Great for lunches, snacks, and with many meals. This soup freezes well and will keep in the freezer for at least 6 weeks. It may hold longer, but I generally run short of freezer space in that length of time, so I take it out and eat it.